Osteoporosis is a common condition among menopausal women. As a woman transitions toward menopause, she experiences a reduction in estrogen levels, which speeds the degeneration of her bones. If ignored, the weakened bones can reduce her overall strength and result in frequent fractures. Because of this link to hormones, women are far more likely to experience osteoporosis than men. The best strategy to avoid osteoporosis is through prevention. However, medications to slow down the process do exist, although they may not be as effective as prevention. Bisphosphonates (or diphosphonates) are probably the most commonly prescribed medication for patients with osteoporosis. These drugs slow down the loss of bone mass by inhibiting the life span of osteoclasts, the cells that break down bone. The bisphosphonate category includes alendronate, risedronate, and ibandronate. There has been some success with these drugs, but typically only after three years of use. While bones can be strengthened and the common types of fractures can be prevented, bisphosphonates have been linked to lesions in the stomach and esophagus, and paradoxically, to atypical fractures after long-term use. It has also been linked to abnormal heart rhythm and muscle pain. 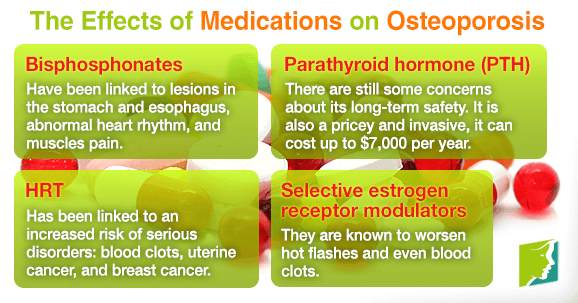 Selective estrogen receptor modulators (SERMs), such as raloxifene or tamoxifen, are used to both prevent and treat osteoporosis, especially in the vertebrae. They act by modulating the absorption of estrogen, stimulating it in the bone and spine, but inhibiting it on the uterus and breast. While SERMs can reduce fracture along the spine, they are known to worsen hot flashes and even blood clots, particularly if the dosage is not controlled carefully. Hormone replacement therapy (HRT) is commonly prescribed among menopausal women. These medications replace the lost estrogen in the body with external artificial hormones, which is why it was once touted as the “cure to menopause”. While it was found effective in preventing osteoporosis, its efficacy as a treatment for general menopause symptoms remains inconclusive. Furthermore, its use has been linked to an increased risk of serious disorders: blood clots, uterine cancer, breast cancer, stroke, and heart attack. Sold under the generic name teriparatide, this medication is a synthetic form of parathyroid hormone, which is normally produced by the parathyroid gland. This hormone can increase the availability of calcium in the blood, and if administered intermittently, it can significantly slow down bone loss. Teriparatide has been shown to greatly reduce the risk of fracture, although there are still some concerns about its long-term safety. It is also a pricey and invasive route to take, since it must be injected and can cost up to $7,000 per year. Not only are pharmaceutical options risky and imperfect, but they also fall short of equaling the protection provided by prevention. The main preventative techniques include lifestyle changes, herbal supplements remedies. For one, it is important to reduce smoking and alcohol consumption, as these habits are known to increase your risk of fracture. Also, be active by incorporating 2.5 hours of low-impact cardiovascular exercise to your week, as well as at least one hour of strength training, such as free weights. Furthermore, calcium and vitamin D supplements will help build and maintain bone. Once osteoporosis has set in, looking for a solution can appear confusing. Knowing the facts behind each one of your options will help you make a better decision and heal safely and effectively. Understanding the difference between osteopenia and osteoporosis can help you determine the severity of your weakening bones.